The moon took on an eerie red hue Wednesday (June 15) during the longest total eclipse in 11 years, amazing skywatchers around the world, even in places where the cosmic event wasn't visible. The total lunar eclipse, one of two that will occur this year, offered 100 minutes of totality as the moon passed into Earth's shadow, but the eclipse's actual progression took hours. "Awesome! We have a perfect view from our neighborhood in Jerusalem, Israel," skywatchers Cecile and Roberta Cohen told SPACE.com in an email. "We started seeing it at 9 p.m. At 10:20 (give or take a minute) the moon was totally eclipsed. We came indoors shortly thereafter because it's cool out, but we can see the moon from our window. Awesome; just awesome!" In Italy, university student David Paleino snapped stunning views of the eclipse as the moon slowly turned blood-red during its march into Earth's shadow. 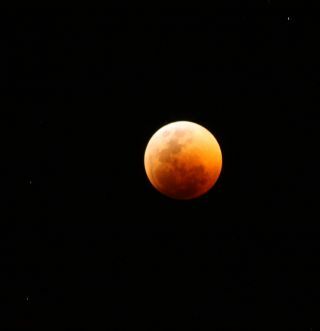 "For an astrophile, a lunar eclipse is always fascinating. I also watched it through my telescope, but unfortunately none of the photos made with that were of good quality. Still, it was a great experience," Paleino said in an email. "I'm located in southern Sicily, and here the sky was crystal clear, so I could enjoy the eclipse since the moon rose. Unfortunately, I know of friends located in other places of Italy who couldn't see it, due to clouds mainly." While North American skywatchers missed seeing the moon's eerie red glow first-hand, a multitude of live Internet broadcasts allowed everyone the chance to experience the lunar eclipse vicariously. Internet giant Google and the skywatching website Slooh teamed up to offer live views of the eclipse from three different locations (Dubai, South Africa and Cyprus), with Google modifying its homepage logo for the cosmic event. A live view of the moon, as it appeared in the Slooh camera, took over one of the letter O's in the company's logo. "Wow! Just Wow!," wrote SPACE.com reader Shawn Roberts in a comment posted on this website. "You can't see the eclipse in North America, but the Internet is just as good with these live shots! Phenomenal!" Total lunar eclipses occur when the Earth passes directly between the sun and the moon, casting a shadow through which the moon passes. The result is often a reddish or deep orange moon, since the sunlight that normally gives the moon its bright appearance (by reflecting off its surface) is blocked by the Earth. "The moon takes on this new color because indirect sunlight is still able to pass through Earth's atmosphere and cast a glow on the moon," NASA officials said in a statement. "Our atmosphere filters out most of the blue-colored light, leaving the red and orange hues that we see during a lunar eclipse. Extra particles in the atmosphere, from say a recent volcanic eruption, will cause the moon to appear a darker shade of red." Wednesday's shadowy moon event was the first of two lunar eclipses in 2011. The next total lunar eclipse this year will occur on Dec. 10. That event should be visible from the western United States and Canada.